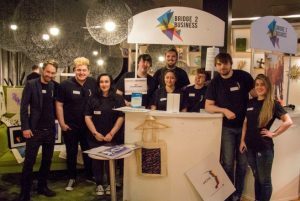 The Bridge 2 Business Programme has been in operation for over 2 years at West College Scotland, and we can now confidently say that we will be available for another year, at the college to Inspire, Support and Connect students! We run a variety of inspiring enterprise and entrepreneurship programmes for young people aged 5 to 30 across primary, secondary and college educations. 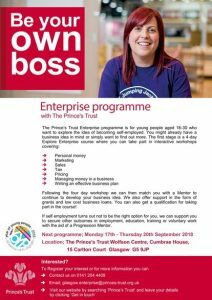 appropriate entrepreneurial role-models and begin their enterprise journey or for those who are looking to take employability and enterprise skills to their workplace. starting up their own business or looking to develop their employability and enterprise skills. Bridge 2 Business market stalls are available on campus for any charity/fund-raising activities. To book a market stall, get in touch with your regional executive on campus: Alison Rodgers – Alison.Rodgers@yes.org.uk to make sure the date is free. There are no costs involved in using the market stall, more than one market stall can be arranged for any event/trading activity and these market stalls can be used off campus too! 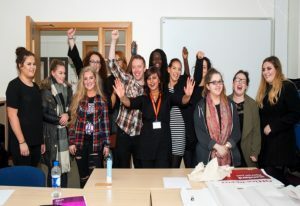 Students can also to become a ‘Champion’ with Bridge 2 Business, in return students can attend monthly enterprise events, receive support from other enterprising organisations, receive freebies/goodies and we will also provide them with fantastic networking and work placement opportunities with entrepreneurs. For more information, please check out the ‘Volunteering & Opportunities’ section. Bridge 2 Business also support lecturers deliver enterprise related modules as part of the curriculum. Bridge 2 Business wants to make the learning experience fun, interactive and engaging for the students. around developing employability and enterprising skills! £100 grants are available for classroom challenges, competitions and events. Guest Speakers/Entrepreneurs can be arranged to come to your classroom to talk to the students about their entrepreneurial journeys and anything specific related to the modules you are teaching to the students. Department led Enterprise Events can be planned with Bridge 2 Business too! Registration and then completing 2 application forms. Please do not send completed grant application forms to your Regional Executive before you arrange a meeting. Your regional executive will be your business mentor throughout the process, who will guide you through the different stages and will explain time scales of when you are likely to receive the monies. You can apply for multiple grants if you have more than one business idea, and can also apply for classroom challenges, events and activities. Various competitions will be running throughout the year, so make sure you don’t lose out on some fantastic opportunities to win prizes and funding for your business ideas. Bridge 2 Business run many enterprise events throughout the year, free events for students and lecturers to attend. Purposes of these events are to give you the opportunity to network, create opportunities and be involved in the entrepreneurial eco-system. Collaboration with Scottish Institute for Enterprise, Princes Trust and Business Gateway when involved in classroom challenges, workshops and activities. Bridge 2 Business is back at West College Scotland for another year of ‘inspiring, connecting and supporting’ students into business and most importantly to help student understand about enterprise and employability skills. Join this 4-day programme to learn more about enterprise, business plan, personal money, taxes and others. Lets Make An Impact is a Get Inspired event focusing on women who are looking to set up a business to make social impact! As most social enterprises within Scotland, are ran by women, we want to celebrate and inspire women to continue making social impact. Lets Make An Impact is a Get Inspired event focusing on women who are looking to set up a business to make social impact! As most social enterprises within Scotland, are ran by women, we want to celebrate and inspire women to continue making social impact within enterprise! Although this is a women focused event, we invite everyone and anyone who is looking to connect with partnership organisations, who can support you on the path to becoming a social entrepreneur. This event will be held on the 24th September 2018 within The Atrium at Sighthill Campus, Edinburgh college. All staff and students of Edinburgh College are welcome, along with any university students who have a keen interest in social enterprise. Throughout our event we will have inspirational speakers, sharing stories of success and the impacts they have made with their businesses so far. Engaging and motivational workshops to share ideas, and solve social problems together. Congratulations to the Reinvent the Wheel winners! The Westside event took place last Wednesday and amongst our amazing talks and workshops, we also ran our “Reinvent the Wheel” competition. With a fantastic number of business ideas that aim to reinvent a product or service, our judges – Evelyn McDonald, Steven Reynolds and Lewa Thomas – had a hard time selecting the most fruitful and impressive ones! Four candidates were asked to come on stage and join us at the Live Q&A, helping both the judges and the audience understand more about their business ideas. The candidates included AidanBanerjee, Malgorzata Rog, Carole Kongolo and MOYA (Minds of Young Artists), who shared more information about their vision, why they want to achieve and how they plan to execute next steps. The 1st winner, selected by the judging panel, was Aidan Banerjee who aims to develop an app to replace student cards. 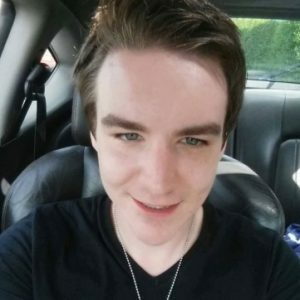 Aidan won a free 3-month incubator space at The Loft, supporting him to bring his idea to life! The 2nd winner, selected by the audience, was MOYA, a student-led Graphic Design collective that aims to design, create, market and promote student artwork, currently based at West College Scotland but aims to expand to further educational institutions. MOYA won an iPad mini 4 that help them with customers and sales processing! 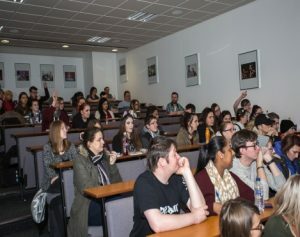 Over 70 Photography students were inspired, supported and connected on Wednesday 9th November, at the ‘Be Your Own Business Enterprise Event’, through Paisley Campus. 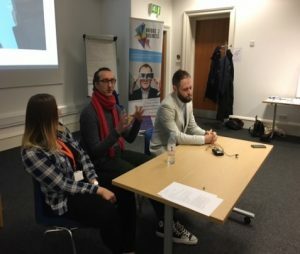 HNC & HND students were very fortunate to have 3 fantastic entrepreneurs from their industry to give them advice and support about business start, employ-ability & enterprising skills needed to work effectively within the creative industry, followed by a Q&A session. The purpose of the event was to give students insight about what they might want to do once they finish their photography courses, knowledge about the resources and funding available to them, their niche in the market, unique selling point and most importantly the type of skills needed to start a freelancing business in photography. The 3 entrepreneurs who were involved in this event were: David McGinty from Rooftop Mosaic, Paulina Brozek from Paulina Brozek Designs and lastly Kris Kiesak from Kiesak Photography. All of the entrepreneurs freelance within the creative industry, in Glasgow however their businesses focus on different aspects of photography such as weddings, commercial, fashion, design and much more. So the Q&A was a worthwhile and fantastic session towards the end of the event. A week after the enterprise event, over 10 students has approached Bridge 2 Business to apply for the £100 Bridge 2 Business Test the Market Grant, which is fantastic as they have been inspired and are making their hobby come to reality! A huge thank you goes out to the Photography Department, at Paisley Campus for supporting the Bridge 2 Business enterprise event for the last 2.5 years. Each year the relationship with the photography students has become stronger and Bridge 2 Business has created various volunteering paid opportunities for the students! Entrepreneur, Saira Javed has been supporting the Bridge 2 Business Programme for over 2 years. 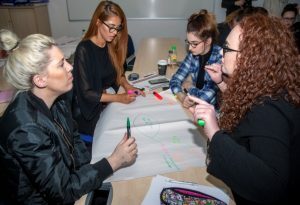 Does what she does best – inspiring, supporting and connecting students to think about enterprise, employability skills and explaining what experiences are needed within the Fashion and Make Up Artistry Industry. 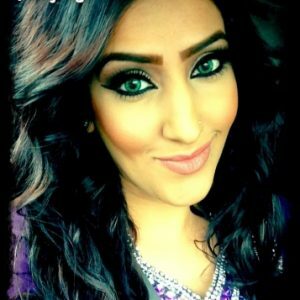 Saira, has been involved with many workshops, events and sessions at West College Scotland bringing her knowledge and expertise to the classrooms. And now she will pick up her Local Hero Award for 2016, at the Herald Fashion Awards on the 13th November 2016 at the Grand Central Hotel, in Glasgow. Certainly all were inspired, connected & supported! ted. 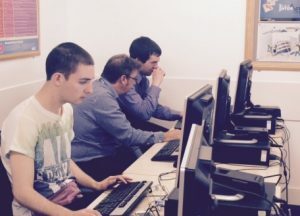 The IT/Computing department at the college collaborated with Bridge 2 Business thoroughly to support the event to make sure it was a successful one! 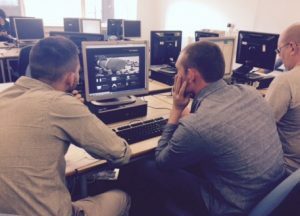 Over the 2 years, Bridge 2 Business has supported lecturers deliver ‘business’ modules to students in the most interactive and engaging way. By embedding ‘enterprise’ into the graded unit projects, module assessments and classroom challenges. Focus of topics has mainly been around business planning, selling skills, and pitching techniques, working with entrepreneurs on website and app development, creating a new package and design for an entrepreneur’s product, planning and organising an enterprise event and many more. 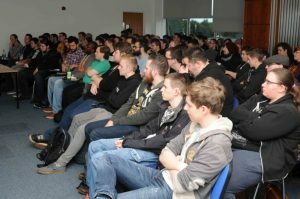 Lecturers believed a touch of enterprise to any curriculum can help make the course interesting and enjoyable for a student, most importantly achieve a pass in the course. It also helps the lecturers tick off various boxes in their marking guide/descriptors to show that their students have been using various skills and techniques, as well as initiative to pass the overall course. Recently, 15 HND Interactive Media students had to develop a website for 4 small business start-ups from various industries. This project ticked off many boxes for students’ graded unit and also lecturers’ descriptor/marking criteria. This project allowed students to work with small businesses, create a service of the client’s choice, organise meetings and consultation with the client, meet deadlines and then towards the end of the project, invite the client back to the college and pitch a short presentation to them about the website. The lecturers believed it was as fantastic way to get the students to complete their graded units, a challenge and also great experience of working with a client. 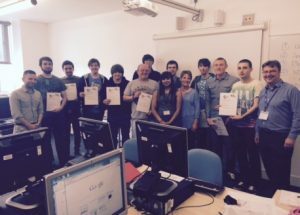 Not only students received a SQA accreditation for passing this module, but Bridge 2 Business also handed out certificates to say well done for working closely with us! Another example involved 30 HND Make-Up Artistry students, who had to complete an ‘enterprise’ module about selling and pitching techniques that were required in order to be a successful representative for a fashion brand. 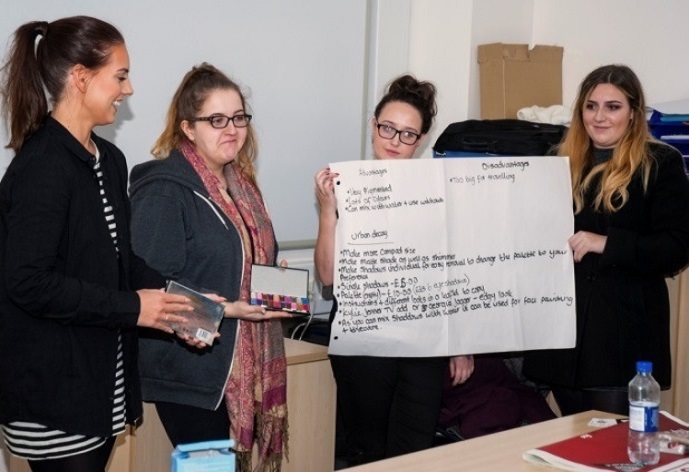 Students had to pretend that they were a representative that worked for a reputable and well known fashion brand such as Mac, Bobby Brown, Urban Decay or Clinque and had to sell their product(s) to a customer, by using various selling and pitching skills. 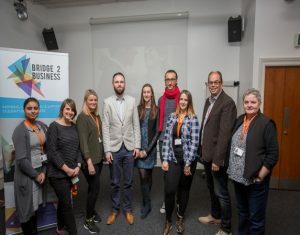 Bridge 2 Business helped to deliver this module by simply running a workshop based around speed dating for role-play, product creation and innovation and then pitching to a panellist of fashion entrepreneurs. All students chose a brand of their choice, researched about their brands in depth, created a power-point presentation explaining why they chose that brand, pretended their brands launched a new product in the market eg mascara or foundation and why this product should be bought. Students were helped with each task by the Bridge 2 Business team and they were also given the opportunity to do role-play to help them improve their pitching skills. Lecturers believed this was a great way to get students to come out their shells and deliver well to an experienced panellist of entrepreneurs. Usually this module is delivered to students by lecturers and no role-play or entrepreneurs come to judge the pitches. However, this year the lecturers decided it was best for Bridge 2 Business to deliver this module to all Hairdressing, Make-Artistry and Beauty students, to make learning for enjoyable for the students. It also helped students receive a pass for that particular module from SQA! How it all kick started for me! My journey with Bridge 2 Business began last year while I was studying HND Beauty, at West College Scotland Greenock Campus. Our lecturer had arranged for Sukie and an entrepreneur from the beauty industry to come to our classroom to talk about enterprise and opportunities for those who were interested in freelancing/business start ups. The session Sukie had organised was indeed very interesting, or shall I say inspiring? The beauty entrepreneur Safina Raja, gave us an insight of what it was like out in the industry, what to prepare for and talked about her experiences and knowledge of marketing, pricing, competition and much more. It was fantastic to know what help and support was available to students who were studying on campus, especially Greenock. I always thought there wasn’t much support available in the Inverclyde region simply because I lived miles away from Glasgow. So, therefore I was glad my lecturer had put us in touch with Bridge 2 Business. The information provided in the classroom was really good and made sense; therefore I had decided to arrange a 1-2-1 meeting with Sukie a week later. When I met with up with Sukie, I told her about my business idea: face-painting as a business start up, she gave me some fantastic information and knowledge of how to get kick started and what direction to take. She explained the Bridge 2 Business ‘test the market grant’ to me and this was amazing as it was a massive help to starting up and taking those first awkward steps to buying the kit, equipment, marketing and more! The grant process was fairly straight forward and easy for me to follow through, did take few weeks however, in the meantime Sukie was there to mentor and coach me to think about the social media channels that could be set up without any costs involved or attending networking events to try and get clients etc. 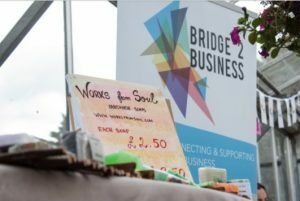 I am so grateful to Bridge 2 Business for all the support they have provided me so far with the funding, marketing, networking opportunities, attending events and most importantly a further referral to Business Gateway for more support. 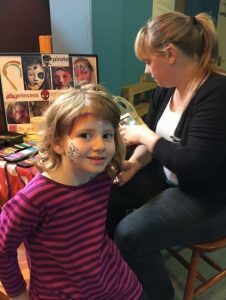 It’s now few months into having my face painting business and I have certainly learned a lot from the knowledge that was given to me by Bridge 2 Business, as well as going out there and experiencing it for myself. I will thoroughly recommend Bridge 2 Business to all those students who are currently studying at West College Scotland to go talk to Bridge 2 Business if you have that business idea which could work and receive the support from them. I still have ongoing support from the Bridge 2 Business team and I know that they are there if I need them. Therefore thank you Bridge 2 Business! Local Hero gives advice to other business start ups about Bridge 2 Business and market stalls. 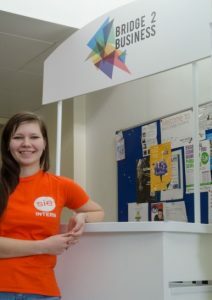 Recently, Laura Kadakovska was interviewed by the Bridge 2 Business team and she told us how the market stall have been the most helpful and useful part of a marketing tool on campus this year. trade professionally with customers on and off campus. With a bit of encouragement, motivation and marketing support from her mentor Sukie, she’s up and running! This year, she ran at least 15-20 market stalls for her own business ‘Works from the Soul’, on and off campus and more than 20 stalls on campus for promotional events, activities and competitions. 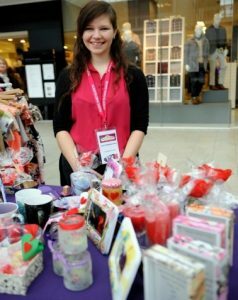 In December 2014, Laura applied for the ‘Test the Market Grant’ from Bridge 2 Business and by February 2015, she was behind the market stalls selling her hand-made goods ranging from candles, smelly soaps to personalised mugs, photo-frames and much more. She invested her ‘test the market’ grant in equipment, advertising, products and website for her business. The money she made from her very first stall has been re-invested back into other trade sales. at least there isn’t a cost involved to hire them. I would strongly encourage them to make use of them in every way as possible. It’s a great way to test the market – put your name out there and build a strong network and clientele! She also mentioned that having a website for online sales is something also to consider, as well as trading at the market stalls. Build awareness and promote yourself using free social media channels, such as Facebook, Twitter and a professional account with LinkedIn. Bridge 2 Business also encouraged her to sell goods via Etsy, which is an e-commerce website selling handmade or vintage goods. Training was provided to Laura, to get her through the different stages of setting up an account and getting started! 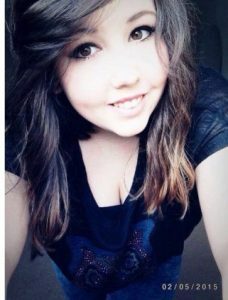 Laura has now officially finished and left college, but she will continue to keep in touch with the Bridge 2 Business team for help and support. Use the market stalls and will be involved in the bridge 2 business trading/enterprise events and competitions in the future. Laura finished off her interview by mentioning that she still has a long way to go, but with Bridge 2 Business’ help she can make her dream become to reality very soon! Over a month ago, local hero Saira Javed, was overwhelmed when a West College Scotland photography student from Paisley Campus volunteered to support her in a charity project. HND Photography student Deanna Barrie, supported Saira by providing fantastic images, designed slideshows and recorded short video clips at the Crookston Community Charity Event which was organised for over 500 guests. Deanna took responsibility and used her initiative on all the tasks and delivered professionally at the event. She spent over a month working with the entrepreneur to make sure all images, slideshows and video clip covered the criterion that was expected from her. Deanna said it was an interesting and challenging project and it was a great opportunity to work with Saira, who gave her an insight of what day-to-day life was like for an entrepreneur. Deanna is a young business start up, in the photography industry and by working with other experienced entrepreneurs like Saira, has certainly opened up doors for other opportunities in the future related to photography. Deanna will continue to work with Saira over the next few months, on projects related to fashion and event photography. Opportunity to work alongside some of our talented entrepreneurs. I am Martin Ganly, 25 years of age, student of West College Scotland. 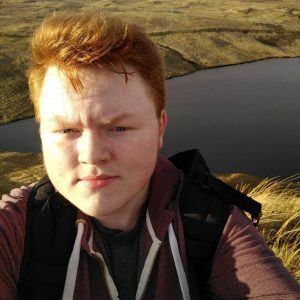 I’ve always took an interest of the entrepreneurial world and have the right mind-set to be creative and innovative when creating/building things combined with a passion for Computing, which has led me to be currently studying Software Development at Paisley Campus. I re-entered the world of learning after a failed business venture, however I am back and now keen to learn new enterprising skills and improve my current skills. Being forward thinking and motivated I am a freelancer on the side, along with my studies to gain some real work environment experience and build my portfolio. I decided to become a Bridge 2 Business Champion and work along with Sukie, because I have been given so many opportunities to develop myself. I recently was given £100 funding towards an enterprising project by Bridge 2 Business, fantastic opportunities to attend networking events, meet entrepreneurs & most importantly I felt part of the entrepreneurial eco-system, where I met like minded people! By becoming a Bridge 2 Business Champion, I believe it will help me grow, develop and get better at my enterprising and employability skills and most importantly this role is flexible and not pressurising in any way. A great way of getting a fantastic reference in the future! So, if you are around campus and see me – please don’t hesitate to stop me and say hi or ask me anything related to Bridge 2 Business and their activities around the campus! 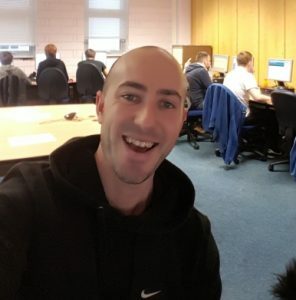 Hi my name is Kieran McVey, I am currently studying Software Development at West College Scotland Paisley Campus. Having just completed my first year, I gained some valuable skills in website development and wanted to put these skills to use as soon as possible by doing some freelancing and project work. Just before the summer holidays, my lecturers put me in touch with Sukie Grewal from Bridge 2 Business, so I could have a chat about developing enterprising and employability skills, in order to help me kick start in freelancing and to see what other opportunities were available to me. Being involved with Bridge 2 Business Programme on campus, has given me the confidence and opportunity to gain some real world experience of the industry I am studying in, also by attending fantastic networking events and being able to apply for £100 funding towards a client project. The Bridge 2 Business, £100 grant has helped massively with my website development plan; it has helped my freelancing business hit off the ground – as well as the 24/7 advice and support which was available by Sukie Grewall. Moving forward, I am glad to be a Bridge 2 Business Champion, this role will help me strengthen my CV, meet entrepreneurs and attend various networking events where I can share my knowledge, experiences and ideas with my peers and further my professional development. If you see me on campus – stop by in say hi! I’m Matthew Bond, 17 years of age and currently studying HNC Technical Support at West College Scotland, Clydebank campus. After completing my Level 5 in Digital Media, it gave me insight on what I wanted to do moving forward with my college course and career; I decided to go for HNC Tech Support. As I’ve always had a great passion for enterprise, computer hardware and IT in general, I also have many years experience in these areas. 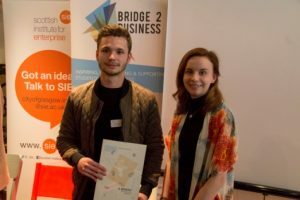 After recommendation from an entrepreneur John Hamelink, I looked into Bridge 2 business as a way to gain valuable experience in the business world and decided to become Bridge 2 Business Champion. As a Bridge 2 Business Champion no doubt I’ll get many great opportunities available to attend networking events, meeting entrepreneurs or apply for funding that allow me to gain valuable enterprising and employability skills that will be sure to aid and help me improve my business knowledge. I have also managed to set up my professional online digital CV via Linkedin! So, if you ever see me around Clydebank Campus be sure to give me a shout if you have any questions. Do you want to become an Intern with SIE? As part of continued growth in driving forward Scotland’s enterprise agenda, the Scottish Institute for Enterprise (SIE) requires a Student Intern to join the team in this exciting project each year from many of the colleges listed below. This is a fantastic opportunity to work alongside an enterprising organisation while studying at college. Please note, while being an intern, you will work very closely with the Bridge 2 Business regional executive at your campus. This is a paid role therefore there are set hours of work which need to be fulfilled each week, for more information – please contact your regional executive. Applicants should have excellent organisational and interpersonal skills and the ability to work on their own initiative. 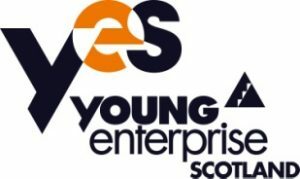 Applicants will also have genuine enthusiasm for entrepreneurship and SIE’s goal of increasing the uptake of entrepreneurial activity and education amongst the student population in Scotland’s HEIs. The successful applicant(s) will be responsible for providing promotional support to SIE on campus, along with institutional entrepreneurship activities, researching existing enterprise and entrepreneurship education and initiatives at their institution and overall, acting as a student face of SIE and institutional enterprise activity. For further details, including a full job description, please contact Alison Rodgers by email: Alison.Rodgers@yes.org.uk or to apply email your C.V. and a cover letter detailing why you would be suitable for the role. Our new programme ‘Pathways into Success’ is the latest learning opportunity we’re offering to young people aged 16-30 who are facing great barriers to employment, education and enterprise. Working in partnership with Glasgow Clyde College, the project will provide two 150-hour taster courses across various curriculum areas in order to allow young people to consider different career options and prepare them for college entry. Courses will start in March and October, with each lasting for 10 weeks. Young people will take part in classroom learning, practical training and work experiences at our Training Centre at Rouken Glen Park and at various community/business locations. They will learn about college life, creating a CV, searching for jobs, discovering personal strengths & gaining qualifications. This is complemented by practical experiences in job sectors like horticulture, landscaping, sport, music, hair and beauty. Bridge 2 Business can arrange work placements and job shadowing opportunities for you; either it’s related to your course or not, speak to your regional executive see what can be arranged. Alison Rodgers is your regional Programme Executive for West College Scotland. She works across all 3 campuses, Paisley, Greenock and Clydebank – so feel free to get in touch with her if you are looking to seek any help or support relating to business start up, work placements, volunteering, funding or general advice.